Deborah Terra Weltman will help writers tap into their intuitive creativity at a workshop from 10 a.m. to noon, Sept. 9, at The Lodge Des Peres, 1050 Des Peres Rd., St. Louis, MO., 63131. Free to St. Louis Writers Guild members; $5 for nonmembers. · What is a creative channel? · How can we access our innate creative flow? · What is the connection between pleasure and creativity? · What kind of mental shift allows for increased creativity? Deborah finds joy in creative work of any kind, especially work that inspires personal and spiritual growth. She adores creative problem-solving, magical places, “treasure hunts,” and imagining from new perspectives. Deborah teaches classes in “The Artist’s Way,” “Treasure Journaling,” and “Realizing Big Dreams” at the local community college and other venues. Her debut book -- Camino Lessons: Losing 21st Century Fears on an Ancient Pilgrimage Trail (the story of realizing her own Big Dream by walking the 500-mile Camino de Santiago trail across Spain) -- is due out soon from PenUltimate Press. 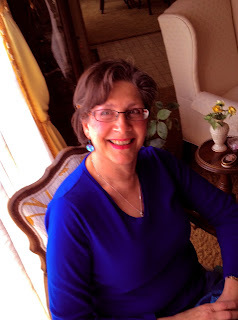 She is also the author and illustrator of two 75-card decks: “A Seeker’s Guide to Internal Paradigm Shift, What if…? Cards" (questions to guide and bless your day) and "A Seeker's Guide to Money and Abundance, What if…? Cards” (questions focusing on peace and plenty).